After several days of traveling, my BF was home once again this weekend. Even better, we weren’t on the go meeting friends, running errands or heading out for off-roading adventures. So, we were able to spend a lovely quiet Sunday morning together. 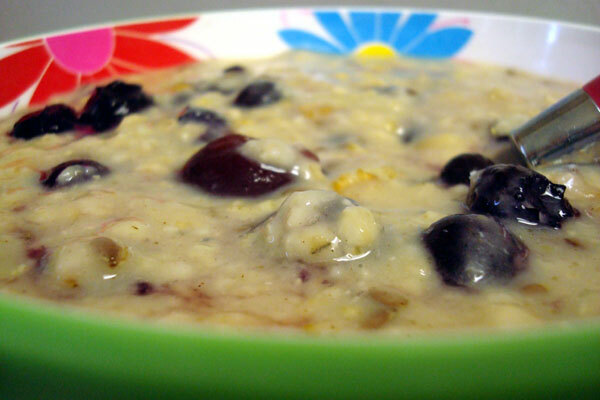 What’s more perfect for a lazy Sunday than a nutty, lightly sweetened oatmeal complemented with blueberries and cherries? Here’s my semi-homemade recipe. In microwave safe bowl, mix 1/2 to 2/3 cup water into oatmeal. Microwave for 1 minute, stir, and microwave again for 30 seconds to a minute until cooked to desired consistency. Stir fruit lightly into oatmeal until just blended and warmed. Entry filed under: clean eating, food review, recipes. Tags: healthy fast food. Use a food journal – it works! Knowledge may be power, but it can be a bummer.